Figure left: Two sets of representative meteor light curves from 1998 and 1999. The brightness of each meteor is plotted versus time. What made the 1998 Leonids differ from those of last year's storm remains a mystery. Certain is that the meteoroids of 1998 crumbled more finely during entry in Earth's atmosphere. This discovery was made by Ian Murray of Regina University, Canada, who recorded Leonid video images onboard the 1998 and 1999 Leonid MAC missions. 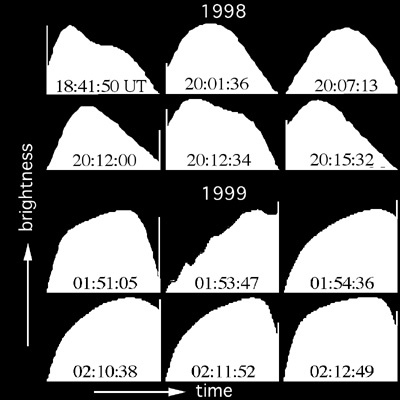 His video records show that both the 1998 and 1999 Leonid light curves were flat-topped, but the 1998 meteors tended to have their peak brightness earlier in the meteor's trajectory. The flat-topped curve is understood only if meteoroids fall appart in numerous fragments upon entry in Earth's atmosphere. The larger fragments are the ones that survive ablation longest and will penetrate deeper. Hence, it appears that the 1999 meteoroids crumbled less fine and contained more larger fragments. The cause of this unexpected behaviour is not understood. Both encounters were with dust ejected in 1899, but at different distances from the comet trail center and at different distances from the comet. We now look forward to an encounter with the dust trail of 1932 on November 16/17, 2000, and encounters with the 1866 dust trail to see how the meteoroids fall appart at different positions in the shower. This result is reported in an upcoming issue of Earth, Moon and Planets that is devoted to the Leonid meteor storm research. Full text (PDF file).